Roland has teamed up with Adidas for what could possibly be one of the best trainer collaborations we’ve ever heard of: Mi Adidas Neely Air | Roland TR-808: Disturb the Peace. Quite the mouthful, and if you were wondering what “Disturb the Peace” is all about, allow us to inform you that ‘808’ is the police code for that particular misdemeanor. 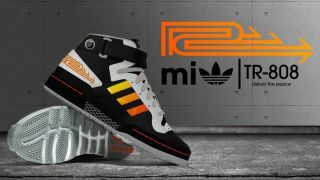 The trainers are a prototype concept developed by Neely & Daughters, and while they have the look of the classic TR-808, with the unmistakable dark grey, orange and yellow colourway, they are in fact a fully working drum machine. The mid-tops are equipped with a volume control and six different pre-programmed settings. We’re not exactly sure how the beats are triggered, but presumably any fans of Footloose should be able to bang out some rhythms. Now this is all hypothetical of course, as these are not for sale, but part of the Mi Adidas “Just for Kicks” creative challenge. Presumably the 303 briefs - complete with tweakable knobs - are on the way.